“Yemen will be tomorrow’s war”. Joe Lieberman, did you actually say that? If there’s one thing harder to be in the Middle East – than an American; it’s someone working with Americans. The Yemeni government is – to a large enough degree; one of our partners – a claim few can make (and some abuse). The Northwest ‘Undie’ bomber has Yemeni connections and so does the Ft. Hood shooter. An alarming number of our Guantanamo catches are Yemeni. And? While more than enough cause for the Cheney-ista’s to ‘Cry Havoc!, and let slip the dogs of war’ – I would (respectfully) ask if we really need to rain fire down on these people? 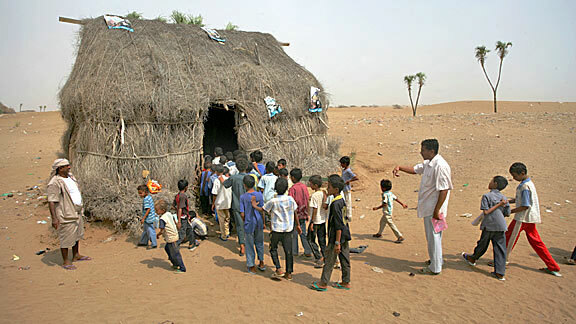 Yemen is literally dirt poor, the image above is a school (and a UNICEF one at that). Twice the size of Wyoming with about 3% arable land and over 24 million people (only 1/5 of whom have jobs), and a little over 100 million assault weapons. Yemen’s got nearly 2000km of coastline bordering the Gulf of Aden (the route to the Suez), which is itself flanked by none other than Somalia (and patrolled by their pirates). So while we can insist on hunting down Al Qaeda in Yemen; it may only take 3 guys, 2 drones, some patience and a carton of Hersheys. It may take more but it certainly won’t require – war! STFU and don’t make it any harder on our Yemeni allies!